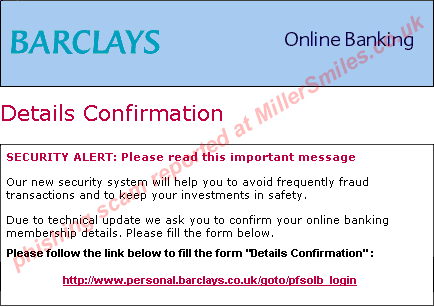 4903 Phishing Scams Nat West, Barclays, Lloyds TSB, Nationwide, Halifax. 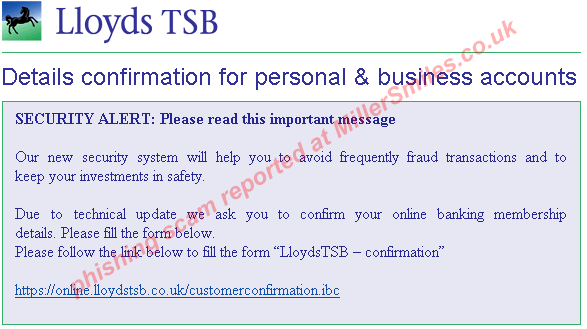 4903 Phishing Scams targeting Nat West, Barclays, Lloyds TSB, Nationwide, Halifax. To all Natwest Bank users! An image with text and disguised link which opens one of the many forged web pages. all of the various forged pages contain forms which ask for log in or account information - all of these forms capture submitted data via a local script (in the same web space). Yes - multiple forged Online Banking pages. 1. Some of the 4903 Phishing Scams exploit the URL Spoofing (canonicalisation) vulnerability in Internet Explorer browsers - run Windows Update to ensure your browser is patched. 2. Some of the 4903 Phishing Scams employ script to open the genuine eBay.com home page as a backdrop to the bogus page. This will completely block access from these domains to your computer, but you must ensure that the file is saved without a file extension - notepad will add .txt to it, if that happens, remove the file extension in Windows Explorer using 'Rename' from the right click menu. 1. Block these two domains from within your Firewall. However, we recommend blocking using the Hosts file as this is used above and before any other third party windows software.